Soputan (North Sulawesi, Indonesia): A powerful explosive eruption occurred at the volcano during 4-6 January. 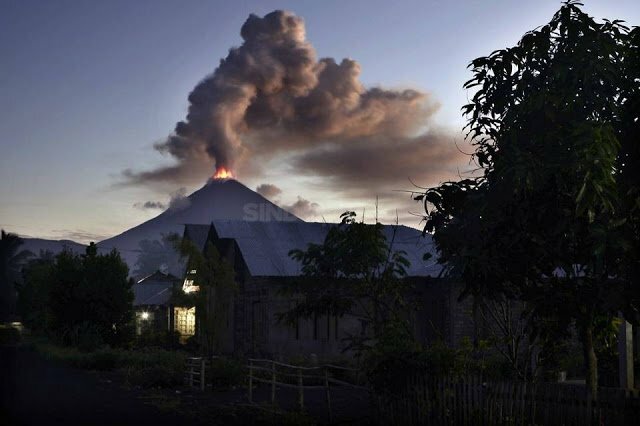 It began with a series of at least 4 powerful explosions between 20:50 on 4 Jan and up to the next morning, producing tall ash plumes that rose 4-6 km above the volcano and drifted north. At least some of the explosions also triggered pyroclastic flows reaching the southern base of the summit cone. Moderately strong ash fall of 1-2 cm occurred in villages about 10 km to the NE of the volcano. Apart from significant damage to farmland because of the ash cover, no injuries or damage to infrastructure were reported. The airport of Manado had to be closed for 2 days. Colima (Western Mexico): The activity of the volcano has remained fairly stable over the past days, with small to moderate vulcanian-style explosions every 4-8 hours on average.